First impressions are always important, yet then can be very deceptive. Like when I first saw the TIMe22 Robusto. The affordable watch world has its fair share of heavyweight champions, but I thought that we found a new one in this watch. One that actually would send me to the gym before I could even consider wearing one. Fortunately, I was wrong. The Robusto is big (45mm) and blunt in its design. 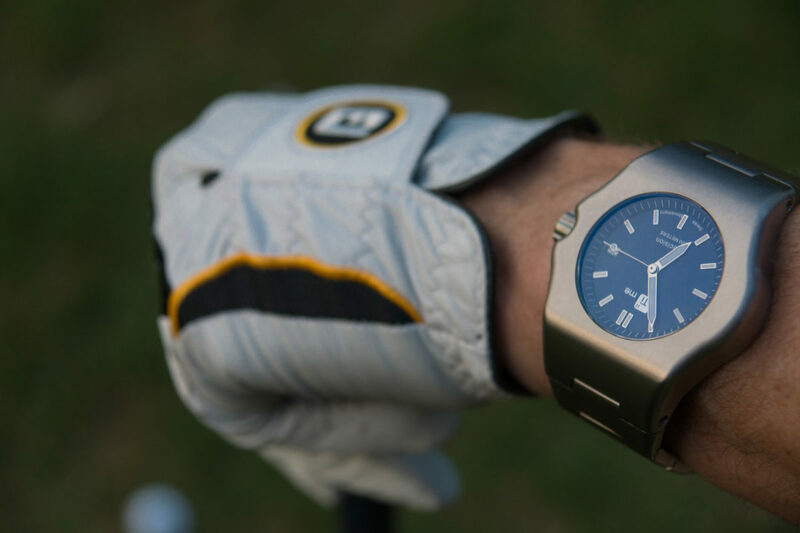 It is an imposing watch, that turns out to be a gentle giant. 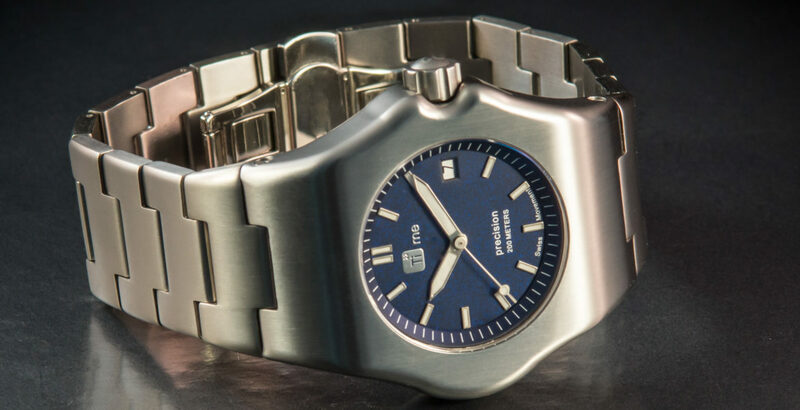 Crafted from grade 5 titanium, which is also used to make airplane parts and surgical implants from, the watch is not nearly as heavy as its looks. With a weight of 130 grams, it weighs about the same as the much smaller, steel Omega Seamaster Professional. Of course, I should have known with the name of the brand referencing nicely to the atomic number and symbol of titanium. Thanks to a screw in crown, and a screw down titanium caseback, the Robusto is also water resistant up to 200 meters. The owners of TIMe22, Stefan and Marc, grew up in the 1970’s and wanted to create a watch that was strongly influenced by this era. Somebody probably told them that this wasn’t exactly the best decade in terms of watch designs because with the Robusto they cleverly avoided some design pitfalls brands in the 70’s didn’t. First of all the watch is unapologetically large. When you create a large watch, don’t make excuses about it, but just let it be what it is: large! The rounded design of the case also makes it that large is not a problem and makes the watch much easier to live with. Of course, the height of only 10mm helps with that as well…as is the fact that it is crafted from titanium, and not in the last place, fitted with an integrated titanium bracelet! That bracelet actually got me pretty excited because it suits the watch, and not many Kickstarter launches feature a watch with a good quality, integrated bracelet. It also is the finishing touch on the look of the watch, not in the least bit because it makes it look even more heavy, solid and robust! No disappointment in the movement area either with your choice of quartz or automatic. Both movements are from ETA, the quartz being caliber 955.112, and the automatic caliber 2824-2. 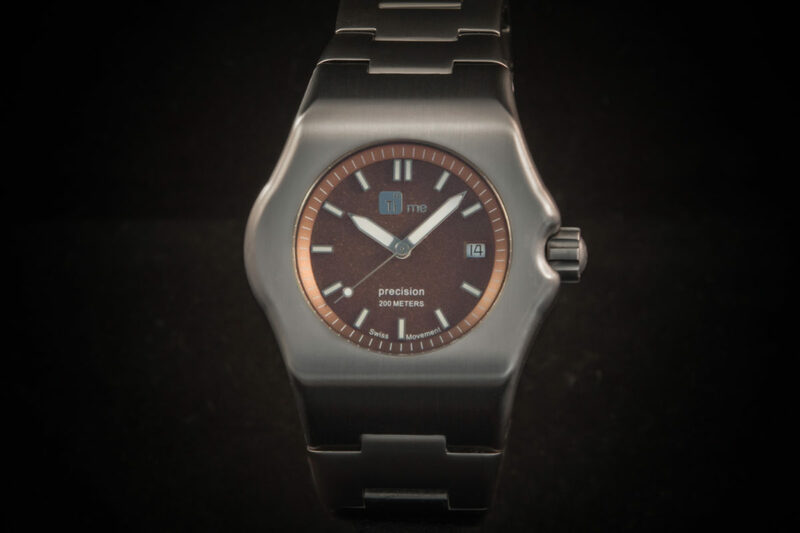 The only other choice you have to make is if you prefer a blue or a mocha brown dial. I am going against my usual preference for blue this time, and think that especially the mocha brown dial matches the design of the Robusto perfectly. Again, TIMe22 carefully avoided the pitfalls of 70’s inspired design by not opting for a burnt orange, avocado green or Brett Sinclair Bahama yellow as dial colors. With 30 days to go TIMe22 has already reached its Kickstarter goal, and that means that the Robusto is going to be build. If you hurry you can still get your quartz powered Robusto for 359 euro’s or the automatic version for 489 euro’s, and with delivery planned in April 2017 the Robusto arrives just in time to show off with short sleeves, showing gain without pain.